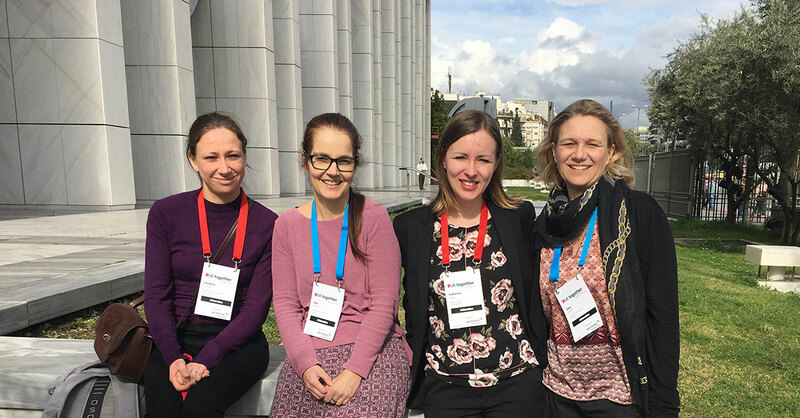 At the end of February, the leadership team of Peschel Communications greeted each day just like the locals with a hearty „Kaliméra, Athina“ – on February 22-23, Anja Peschel and Ellen Göppl attended Elia together 2018, the conference of the European Language Industry Association, in Athens. The objective was to gather new ideas, exchange with colleagues and recruit new freelance staff. 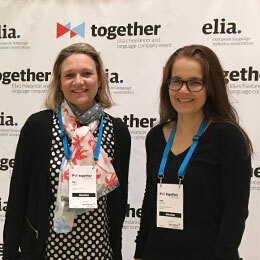 Elia is a European association of language service companies that organizes the together conferences which are also open to independent translators. Our anticipation promptly ticked up another notch as we spotted two of our freelancers on the participant list, both of whom were internal translators in our Freiburg office for many years: Charlotte Marston and Katherina Polig. With its motto “Specialise to Excel,” the conference consisted of three main tracks – Specialisation, Trends and Technology – so there would be plenty of new input! Together we managed quite successfully to attend all of the lectures that were of particular interest to us. The widely varying topics ranged from the translation of mandatory documentation for clinical studies to terminology maintenance in partnership with the customer and the hotly debated subject of machine translation (MT) and postediting (PT). Notable highlights for us included the presentations on faster and more ergonomic translation (and reading!) as well as “Simplified Technical English.” In addition, we were particularly pleased with the presentation by our “good old acquaintance” – István Lengyel, co-founder and former CEO of Kilgray/memoQ. We once kept in regular e-mail contact with him, when he was still working personally with support at Kilgray. In Athens he spoke together with his most recent employer, Gonzalo Urriza, on what can go wrong when making strategic decisions in the language industry – a very honest and refreshing presentation. On the second day, practical information and tips on the subject of machine translation and postediting were presented by Valeria Filippello, computer linguist at SDL. We are at this moment working diligently on both of these very timely, closely linked topics. It is not so easy to bring clarity to the various types of MT (statistical, rule-based, neuronal, …) and levels of postediting, or correction of machine translation by qualified linguists, but the speakers represented the diverse aspects in a very clear and understandable manner. In summary: Attending an industry conference is always worthwhile, even when a few presentations did not go into enough detail for our level of knowledge. Nonetheless, we took away many new ideas, information and also some contact data for potential new freelance staff. After a free half-day of exploring Athens and once again enjoying the Greek cuisine, we headed home extremely satisfied … and we were happy to have soaked up some sun and warm weather!